Welcome to A Yard Art, a Yard Sign company, who offers the best yard signs and cheapest Yard Cards you will find in the Indianapolis and the surrounding areas! Call us today at (317)862-1486 to get more information. Our Yard Sign company is located in Indianapolis, Indiana, but we also provide superior Yard Cards and Yard Signs to the Indianapolis surrounding areas as well. Call us at (317)862-1486 to ask about our Yard Signs specials. If you are looking to rent a Yard Sign, look no further. Yard Signs in Indianapolis is the No. 1 Yard Card rental company in Indianapolis! Our goal is to provide our customers with outstanding, cheap, affordable Yard Signs delivered by our reliable company. We have the cheapest rates in the Indianapolis area, and if you find a cheaper rate, we match our Yard Sign competitors prices! Our Yard Signs are a cut above the others as our Yard Card company focuses on you, the customer. Looking for the best discounts and deals for the best Yard Signs to rent in Indianapolis, IN? Call us and reserve your Yard Card today! Yard Cards designed by Yard Art gives the best service for the best price! Call us today at (317)862-1486. Why rent from Yard Art? If you are renting a Yard Card that is a surprise, we deliver those late at night through the early morning so that they wake up to them. Planning a surprise party and need it delivered at a certain time? No problem. Call us at (317)862-1486 and book your Yard Sign in Indianapolis today. Needing a business Yard Sign to get more business? We have excellent business Yard Cards that are the cheapest in town! Call us at (317) 862-1486 and ask us about our special rates for your business Yard Sign. We even service HOA's for your Community Garage Sale Signs, Community HOA Meeting Yard Signs and so much more! Birthday: Nothing says surprise more than a Birthday Yard Card by Yard Art. Wanting to surprise the birthday boy or girl at their school? No problem! We work with and place signs at Cathedral High School, Roncalli High School, Perry Meridian High School, Southport High School, Lutheran High School, Lawrence Central High School, Lawrence North High School, Mount Vernon High School, Fishers High School, Hamilton Southeastern High School, Heritage Christian School, Brebuef High School, Cardinal Ritter High School, Franklin Township High School, Whiteland Community School, Greenwood High School and so many more! We make sure the birthday Yard card is there by the time the child arrives to school. Wanting a birthday Yard Sign at your home in Indianapolis or the surrounding Indianapolis area? Yard Art delivers these in the late evening/early morning hours so they wake up to the Yard Card birthday surprise! 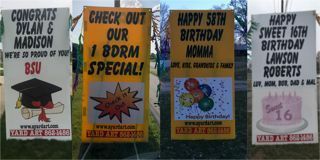 We can also place these birthday Yard signs at any location you choose! Businesses, party venues or wherever you have permission to place the birthday Yard Card. Graduation: Our Graduation Yard Cards are superior to our competitors. Let the world know how proud you are of your graduate by renting a graduate yard Sign by Yard Art.